How does an ancient Maya vase end up in a UK museum? I started working on a case study in contrast yesterday: the story of how two Maya vases ended up across the sea. In a situation where once the surface was scratched a big gaping hole opened up. One vase was purchased in 1930. The other in 1976. During the years between, Guatemala (where the pieces come from) and, indeed, the whole Maya region was raped and pillaged to produce items for Western collections. The Fenton Vase, British Museum, Am1930,F.1. 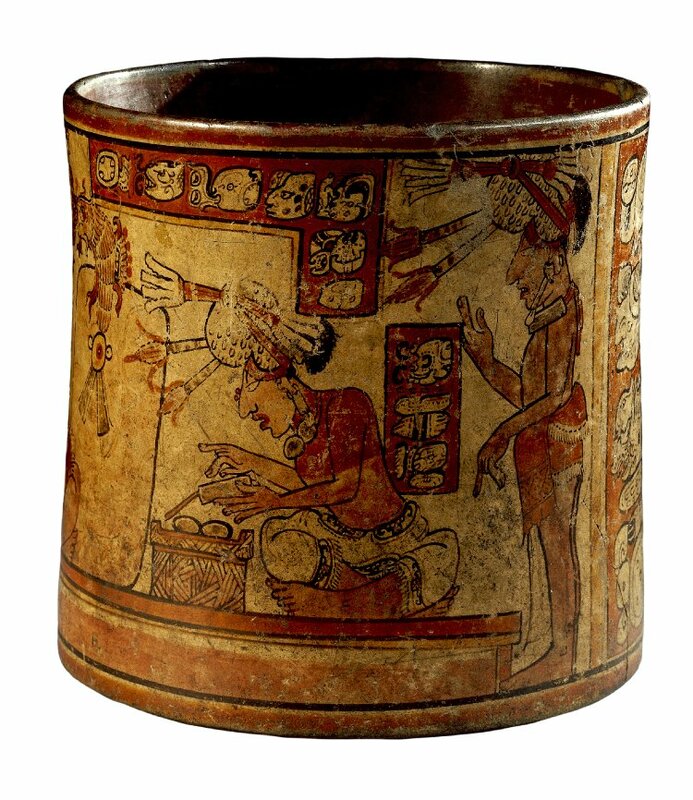 Miller (1989: 130) records that the so-called Fenton Vase was excavated from the highland Maya site of Nebaj in 1904 and, subsequently came into the possession of an English collector named C.L. Fenton. This almost certainly means that it was not recovered during a stratigraphic archaeological excavation which might set off alarm bells. However, *NO* Maya pot had been excavated in a way we would consider scientific at that point. The first stratigraphic excavation of a Maya site would occur in the lowlands at Holmul a few years later (Yates 2013). The Fenton Vase has the best provenience possible for its day. Clearly the vase left Guatemala and I am not exactly sure when. Yet I know it was out of Guatemala by 1930 when it was purchased by the British museum. Guatemala did not pass a law requiring export permits for antiquities until 1947, thus it seems most likely that the piece left its country of origin in accordance with the law of the day. The Fenton Vase is not an illicit antiquity. No laws were broken during its excavation, purchase, export, import, acquisition, and display. It is a beautiful window into the art of the Maya. We should enjoy it. Bad. Purchased in 1976 from an American collector known to deal in looted material. No info from before that date. Bad. Stylistically, it probably came from Chamá. Starting in 1910 and over the span of 25 years, Robert James Burkitt conducted excavations in the Maya highlands for the University of Pennsylvania, as well as collected items for their museum. The core of his collection are nearly 24 Maya vases from the site of Chamá. These vases are not considered to be illicit antiquities and, doing the math, were excavated, recorded, and exported before Guatemala required any sort of permitting to do so. The polychrome vases from Chamá have a distinctive chevron pattern around their lip and base. The only non-illicit pots to display this pattern are those excavated by Burkitt at Chamá. The rest were looted, trafficked, and are illicit. 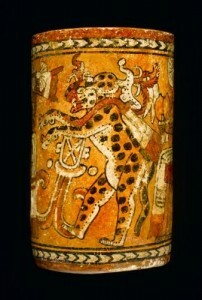 In 1976, the National Museum of Scotland purchased a Maya vase from Robert and Marianne Huber. The vase displayed the characteristic chevron pattern of Chamá. According to their records, the vase was in pieces when it was purchased and that Huber had a commissioned restoration done. That the vase was in pieces implies that it was not from some sort of semi-mythical old collection, rather was a recent looted find. The NMS records that after the restoration, two additional fragments of the vase ‘were obtained’. This is ALL the information that they have on the piece. Who was the NMS buying from? Well I haven’t had much time to dig very deep into Huber, but I don’t really need to. In 1964, Robert Huber sold fragments of a Maya stela to to Brooklyn Museum for $3000 (O’Neil 2012: 200). The stela wasn’t from nowhere, it was actually a known monument called Stela 3 from the site of Piedras Negras. It had been recorded at the turn of the century by an archaeologist/explorer. Looters in the early 60s tried to saw the central figure out of it, failed, but stole some fragments of the hieroglyphic inscription. These are the fragments sold by Huber. The stela was destroyed. This particular case made it into Clemency Coggins’ famous 1969 piece in Art Journal. The pressure was so great that the Brooklyn Museum voluntarily returned the stela fragments to Guatemala in 1970: the same year of the UNESCO convention. They are now in Guatemala’s national museum. All of this went on before the 1976 NMS sale, but the NMS bought the piece anyway and the vase remains in the NMS collection. 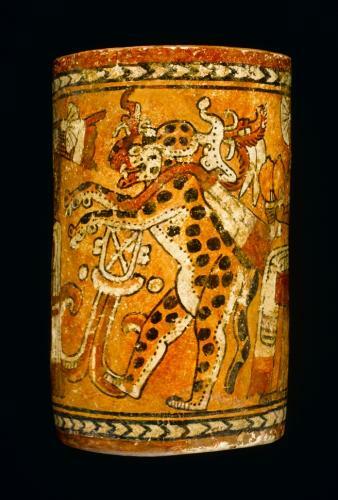 The Waterlily Jaguar Vase is an illicit antiquity. We have no information about who owned it before 1976. It was purchased in pieces implying that it was recently excavated. It was almost certainly taken from Guatemala after 1947 and without an export permit. It almost certainly came from the Guatemalan site of Chamá and is not part of the only non-illicit collection of pottery from that site. It was sold by a man who is known to have dealt in stolen and illicitly trafficked antiquities. It was purchased by the NMS without any information and after the 1970 UNESCO convention was signed. Starting in the 1950s but really hitting the fan in the 1960s, the Maya region was hit by a wave of endemic looting. Nearly every known Maya site in Guatemala was looted, for example: El Zotz, Piedras Negras, Rio Azul, Xultun. 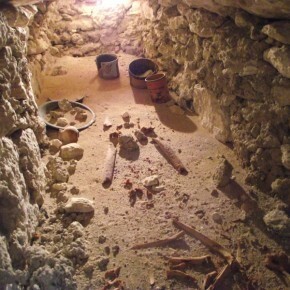 Several previously unknown sites were completely sacked before archaeologists could locate them. The goal of this widespread, often systematic looting was to produce items for Western private and museum collections, such as the infamous November Collection of Maya Pottery, now in the Museum of Fine Arts, Boston. When I say looted, I mean that massive temples were bisected by trenches. Dynamite was used. Worst of all, very poor people lost their lives to cave ins and to disputes arising from the transport and sale of these objects. A few archaeologists were hurt in all this. Some archaeological assistants were murdered. Thus the loss is both physical and intangible. Lives gone, the heritage of humanity gone. All to place items on little pedestals under glass. All to lose the information about the Maya that we could have gleaned. Sadly, Nebaj was hit by looters during this time. A number of Maya vases have appeared on the illicit antiquities market that appear to be in the style of the Fenton Vase and may have even been painted by the same individual. One particularly notable example is a vase that was acquired in 2012 by the Cleveland Museum that I wrote about here. The pot caused a stir because of its poor provenance and clearly looted nature. Because that pot and others in the style were looted we will never know how they related to each other and to the ancient Maya people who used them. Nebaj and Chamá are quite close to each other, at least as the crow flies, and are of the same general ‘highland’ Maya tradition. Yet the Nebaj of 1904 was quite different than the Chamá of 1976. What remained of the Maya was different. In 1904 there was possibility; in 1976 there was loss. I feel I would be remiss if I didn’t mention what the 1980s were to the region these sites are in. This is a very Maya part of Guatemala and that means that during the Guatemalan Civil War genocide occurred. A quick look online turns up numerous accounts of thousands of Ixil Maya being slaughtered near Nebaj in 1982, perhaps by individuals who have an extreme amount of power in Guatemala today. Guatemala was going scorched-earth at that point. Many of the people from that region are among the disappeared. I am not saying that the War had anything to do with the looting of sites in this region (although, note, I am not saying it didn’t), I just want you readers to think about the sorts of lives that people near Nebaj and Chamá have lived, and to whom cultural property is both taken from and repatriated to. I’ll be working more on these pots and others soon. Now, now I need to sort out some other things. Coggins, Clemency Chase (1969) Illicit Traffic of Pre-Columbian Antiquities. Art Journal 29(1): 94–98, 114. Miller, Mary Ellen (1989) The History of the Study of Maya Vase Painting. In The Maya Vase Book, Justin Kerr (ed.). New York: Kerr Associates. 128–145. O’Neil, Megan E. (2012) Engaging Ancient Maya Sculpture at Piedras Negras, Guatemala. Norman: University of Oklahoma Press. Yates, Donna (2013) Publication as preservation: a remote Maya site in the early 20th century. In From Plunder to Preservation: Britain and the Heritage of Empire, 1800–1950, Swenson & Mandler (eds). Oxford: Oxford University Press.